2015 wasn’t that long ago. In 2015, the Jets fielded the No. 11 fantasy quarterback, the No. 10 fantasy running back, and the Nos. 3 and 13 wide receivers. The offense was clicking. Their average top finisher at each of those positions in the three years since? 24th (quarterback), 30th (running back), 41st (wide receiver). From a fantasy perspective at least, you could have ignored the Jets since 2015 and you might not have noticed any difference. The seeds have been planted, though, for that to potentially change going forward. The Jets gave the quarterback job to Sam Darnold to start the year in 2018, and while there were some bad times, he returned from injury in Week 14 and was literally PFF’s top-graded quarterback the rest of the way, logging an 87.7 grade and a 6:1 TD:INT ratio. Now entering the 2019 offseason, the Jets have the second-most cap space in the league, a new offensive-minded head coach, and a promising quarterback with a year of seasoning who will still be only 22 years old when the new season begins. That means they can make plenty of moves. This is obviously the big one. Nothing against Isaiah Crowell, Bilal Powell, or Elijah McGuire, but there isn’t a Bell anywhere in that group, or particularly close to one. 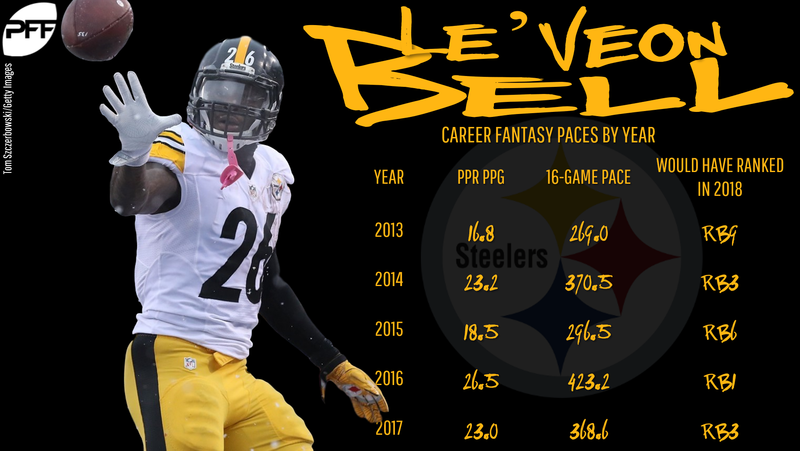 And while yes, the value of running backs is at a low point, it doesn’t mean they have no value, especially for a team that could afford to pay Bell the money he’s been waiting for without stressing the rest of their cap space that much. You’d obviously want to help the 25th-ranked offensive line as much as possible with Bell or without him (see below), but giving a young quarterback one of the two or three best running backs in the league, and a dual-threat with plenty of receiving chops, would raise Darnold’s ceiling considerably and wouldn’t bring Bell’s down much from his heights in Pittsburgh. Spencer Long got the most playing time at center for the Jets in 2018 at 805 snaps. Those 805 snaps translated to four sacks, 20 QB hurries, and a 46.4 overall PFF grade that was the second-worst of 39 qualified centers, 200th of 208 qualified O-linemen. Meanwhile, Morse was a dominant pass-blocker for the Chiefs, with the sixth-best pass-blocking grade for the whole year (including the playoffs). He allowed three sacks as a rookie in 2015 but has now played 45 games and 1,634 pass-blocking snaps since without allowing any more, the longest such streak in the league. The Jets need more offensive line help than a single guy (and should explore that), but Morse makes a lot of sense for the team as a first major step. We thought Quincy Enunwa would fill the slot-receiver role for the Jets early in 2018. But the team seemed determined to move Enunwa outside, increasingly going with Jermaine Kearse in the slot, who is both a free agent and not actually very good. So if that’s the game plan for the recently extended Enunwa, and Robby Anderson is already on the outside as well, the team should look to bring in a Beasley type in free agency to fill that slot role. Chris Herndon was a pleasant rookie surprise at tight end, and an offense of Bell, Enunwa, Anderson, Beasley, and Herndon wouldn’t exactly be the 2018 Chiefs, but it would be the best top-to-bottom group of skill players the Jets have had since at least that 2015 season if not before.